I have some really amazing discoveries from Decorte this year, mainly their color collection. 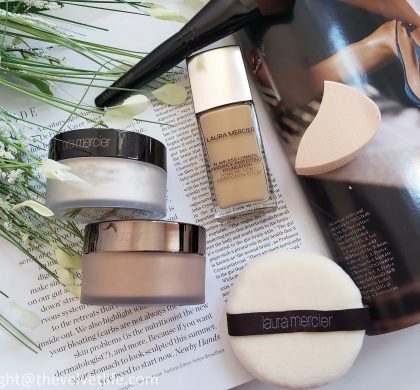 I reviewed a few products here which are pretty much in the rotation and are very much loved by me. The eye glow gem is one of my favorite eyeshadow formulas and from inside, I do want every single shade in that eyeshadow, the formula is so soft, bouncy, creamy and staying power on my eyes is so so good, if you follow me on Instagram, you might know how many times I have shared it in my Insta stories and also in my feed. I have one new shade in my collection which I will swatch in this post. I have the highlighter from the brand which I finally got a chance to try. 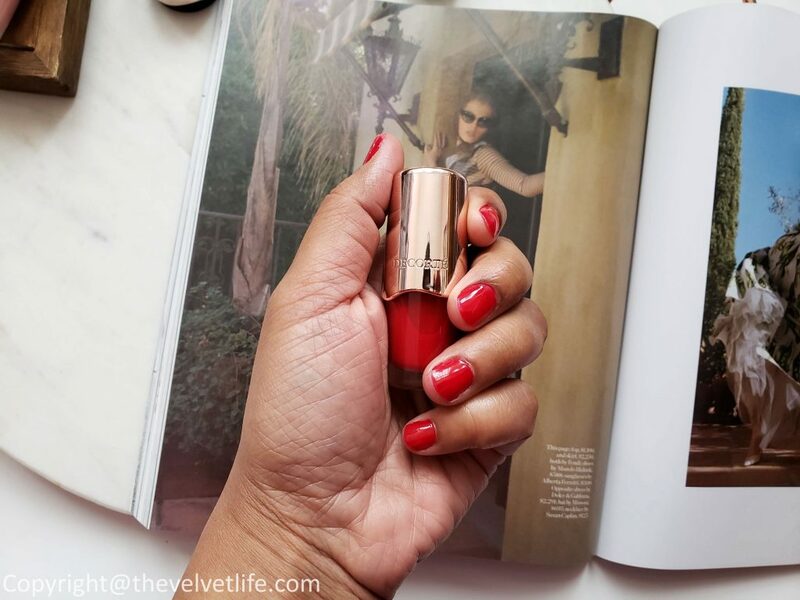 Along with the eyeshadow and the highlighter, the newly launched Decorte Nail Enamels are also discussed in this post. 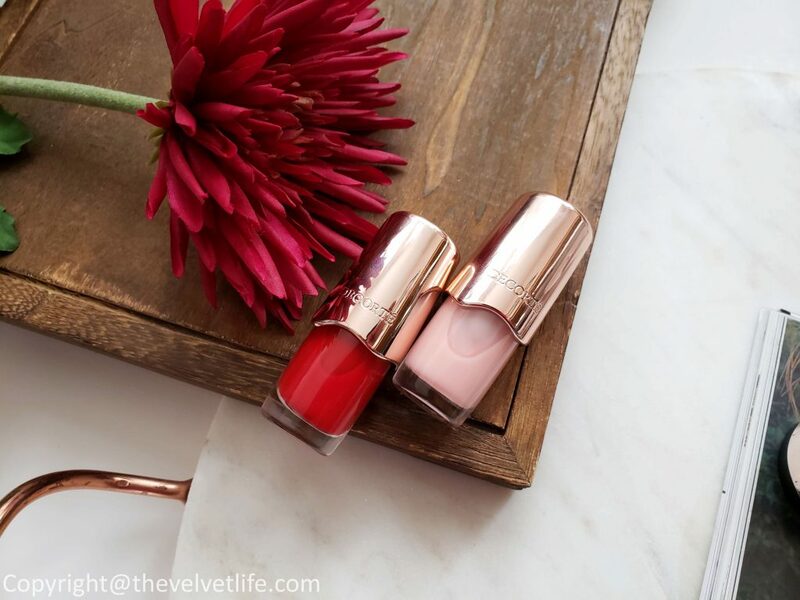 Decorte Nail Enamel is described as a new generation of lacquer which utilizes contact lens technology, each formula is infused with O2 Transformer™, an oxygen permeable resin that creates a “breathable environment” for the nail. Advanced skincare actives deliver anti-oxidant and moisturizing benefits to help improve overall nail health while delivering exceptional performance; one-pass uniform coverage, high-gloss finish, quick-drying and long-wear. The nail enamel is available in 19 Shades. It is paraben-free and toluene-free. 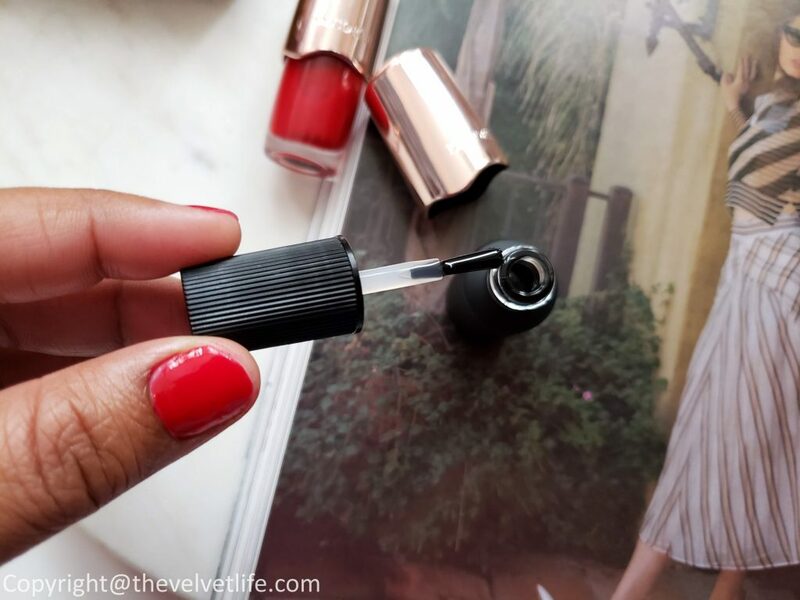 I love a good nail color and if the formula is quick-drying, moisturizes my nails, looks great, keeps my nails in good condition, I am all for it. 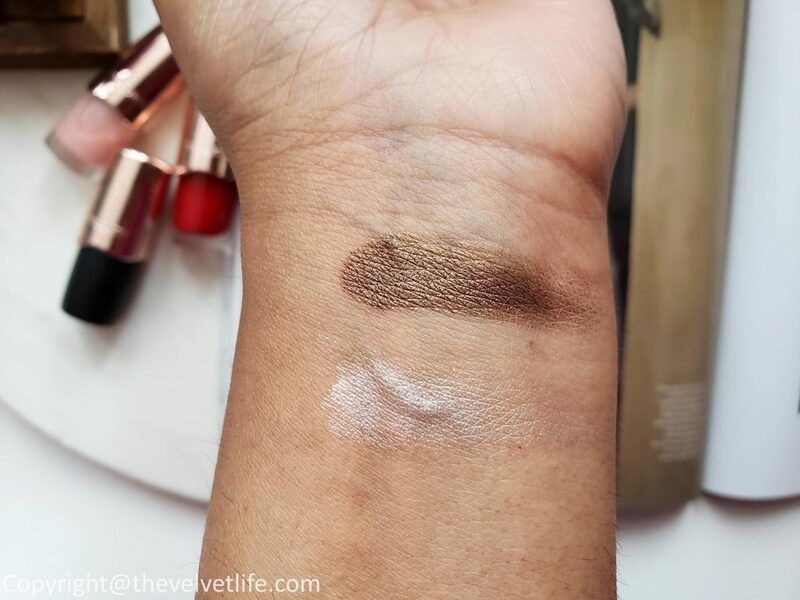 I have two shades swatched in this post and the third one is the base or top coat which is clear. The shade RD441 is a beautiful red shade which I am loving, it is a beautiful shade of red which will look great on most of the skin tones. It makes my hands look so nice and bright, I would say they look so alive and young in this color, never makes them look dull. 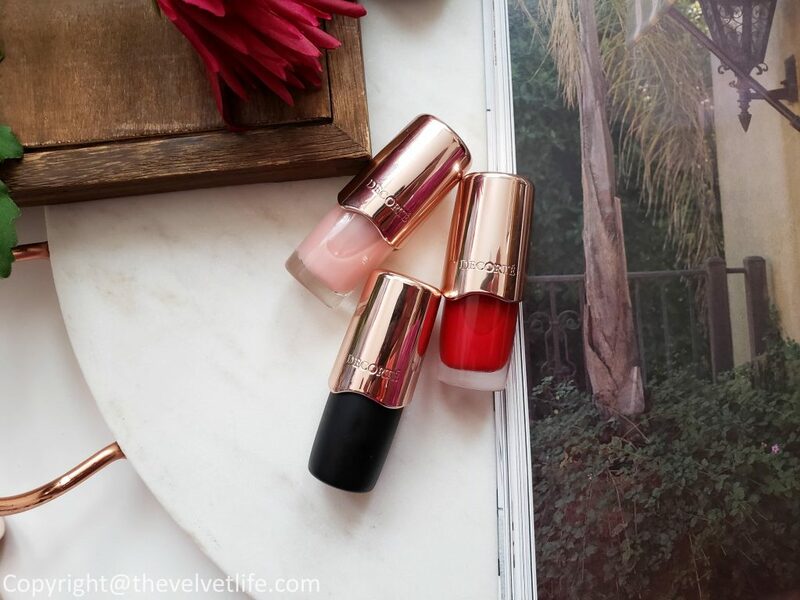 The formula does dry quickly and the finish is glossy. The other shade I have is PK843 which is a pinkish neutral shade on my skin tone and is really pretty. 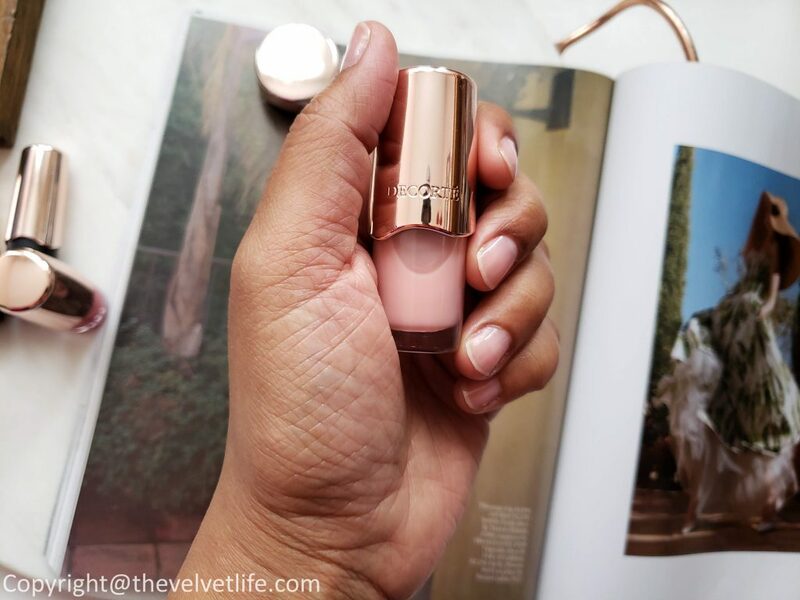 Even this shade does not make my hands look dull or washed out, but is a pretty neutral shade making them look fresh and nice. Decorte base and top coat is described as a serum base formula that offers a high-gloss, lasting finish. It utilizies contact lens technology, each formula is infused with O2 Transformer™, an oxygen permeable resin that creates a “breathable environment” for the nail. Advanced skincare actives deliver anti-oxidant and moisturizing benefits to help improve overall nail health while delivering exceptional non-yellowing, high-finish performance. It can be applied as a base coat to smooth the irregularities of the nail bed and can be applied as a top coat, after nail enamel is completely dry, for a durable, high gloss finish. Based on the need, it can be used in both ways. Decorte Dip in Glow cream highlighter is described as a soft-to-the-touch highlighter for full-on luminosity. Packed with serum-like actives and moisturizing benefits, a glow-from-within effect is created that no powder can achieve. 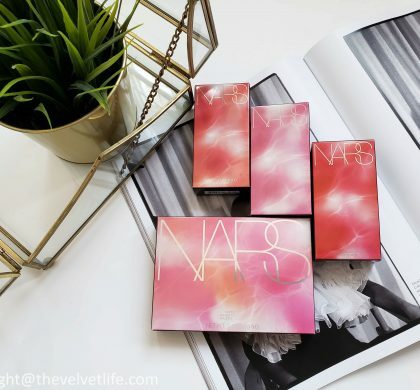 Use under foundation for a lasting radiance. Perfect to accent cheeks, the arch of the brow and any other areas for an intense highlight effect. It applies nicely with fingertips. Sweep fingertips gently over the surface as the product is very soft. The formula of this cream highlighter is so soft, creamy, and melts into the skin. It looks very natural and gives a beautiful radiance to the skin. It looks great even on the eyelids to give them a glowy finish, just alone or even on another eyeshadow. The staying power is nice and stays put for the whole day. 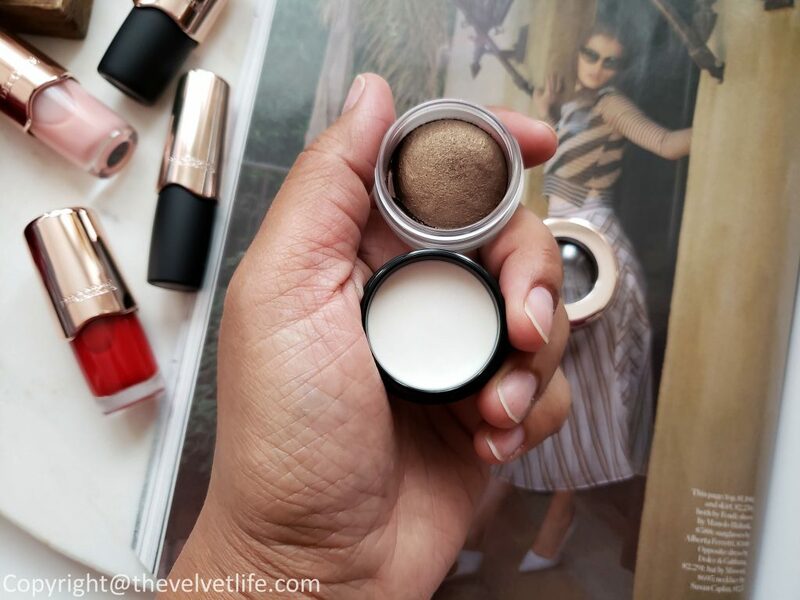 Decorte eye glow gem is indeed a gem for me, it is one of my favorite eyeshadows. 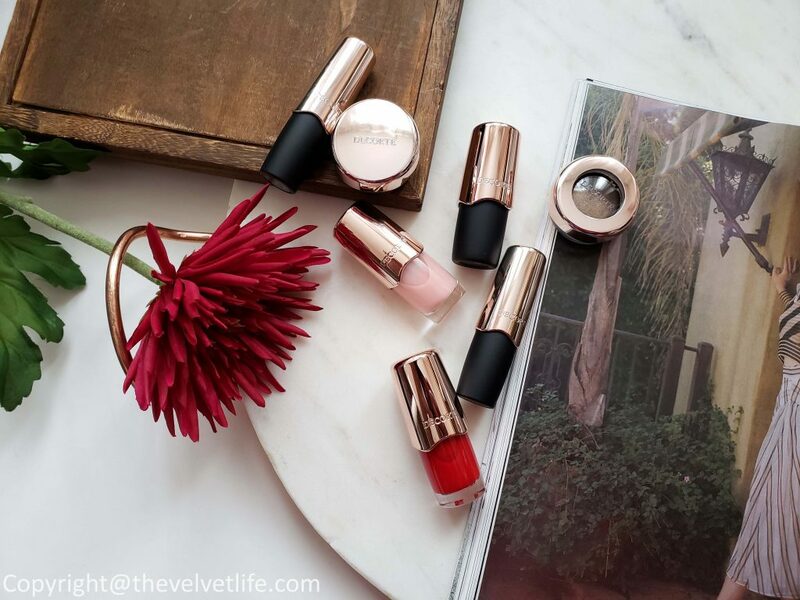 I have reviewed the formula and few shades here in detail. I am so happy to add this shade BR380 into my collection. It has a dewy-like texture blends effortlessly for a lasting hold of high-impact three-dimensional color. It does not get dull or smudge and gives a lasting, beautiful finish. It is a nice shade of taupe which gives a nice depth to the eyes. It is an everyday shade which I have been using most of the days at work. 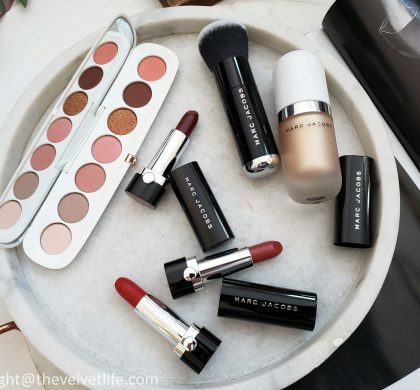 Overall, I would recommend these products for their formulas and shade range. They are not new to me but have been using them in my daily makeup routine, check my Insta stories regularly to see how these look on me. Decorte skincare and makeup products are available at Saks Fifth Avenue.